We’re proud that WordPress.com was awarded all five possible stars in the report — one of only two services to earn that honor. 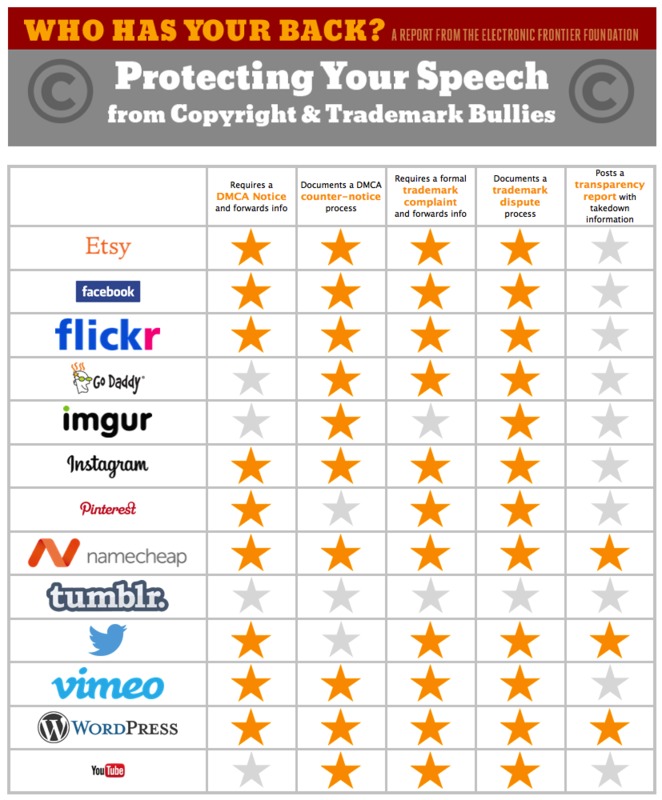 “When a private citizen or corporation wants to silence speech on a major online platform, the quickest method is often a copyright or trademark complaint,” the EFF correctly noted. This isn’t what the law intended, but it’s a practice that we see all too frequently. We strongly support the rights of all creators to reasonably protect their works — WordPress.com users create millions of original (and copyrighted!) posts every day, after all — but we are irked when IP holders stretch their legal rights to the point of abuse. The law is meant to also preserve free expression and fair use. So we strive to defend those liberties and build tough safeguards against censorship. Otherwise WordPress.com, and the Internet at large, cannot remain a free, open, and vibrant platform for all. A major theme of the EFF report is transparency — how well do internet companies explain their policies to the world and especially to their users? This is crucial because copyright, trademark law, and the enforcement and takedown processes remain an obscure and misunderstood facet of the Internet. We’re continually working to improve on this front and are optimistic about similar efforts underway at many companies across the industry. The EFF warmed our fair-use-loving little hearts by specifically citing Automattic’s lawsuits in response to abusive takedown requests, policy to have humans carefully review all trademark complaints, and recently expanded transparency report. They also gave shout-outs to great work done by our peers, such as Etsy’s fantastic explanatory writing and Twitter’s two solid years of standard-setting transparency reports, from which we’ve certainly drawn inspiration. Have a look at the full report. It’s an interesting read, top to bottom. There’s even a PDF version for all you lawyers stuck in the last century. The animated GIF used above I believe to be fair use of a scene from the Fox Broadcasting Network series Bob’s Burgers. If Fox disagrees, well, they know how to reach us.